History: The origins of the Demon-Riders are unknown. (Thor I#141/2) - Calling on the Demons of Darkness, the fury of the thousand winds, and the witchery of the endless night, Mogul summoned the Demon-Riders, sending them to kill Thor and the Warriors Three as they approached Zanadu, the Mystic Mountain. They rode behind Alibar, who soon realized that they were not merely following him, and that they would trample and slay him if he slacked his pace for a second. (Thor I#142/2) - Alibar and the Demon-Riders approached Thor, Fandral, and Hogun. 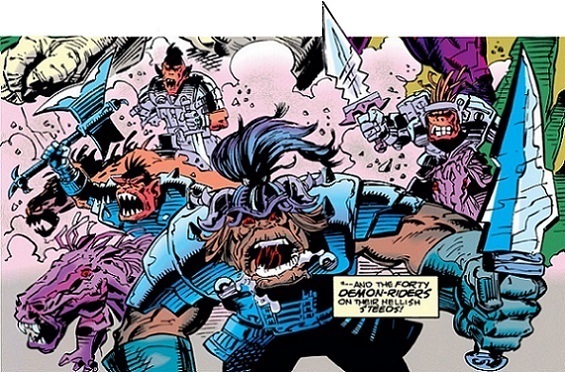 (Thor I#143/2) - The Demon-Riders attacked the heroes. (Thor I#144/2) - Alibar joined forces with Thor and his allies against the Demon-Riders. Though the heroes succeeded in driving off the first wave, a new group of forty Demon-Riders soon charged them. Volstagg then arrived and used the Enchanted Rod of Wondrous Wizard Power to banish the Demon-Riders back from whence they had come. 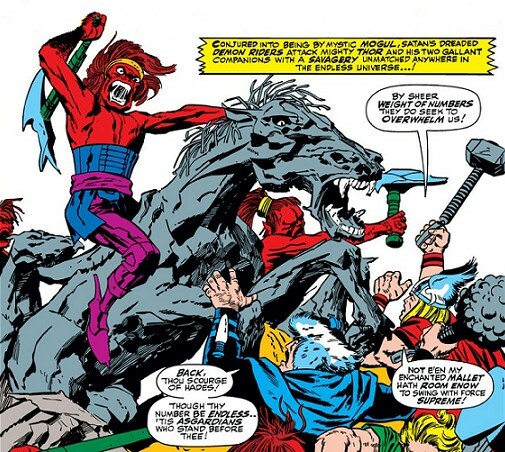 (Thor I#474(fb)) - The Demon-Riders charged in front of the Jinni Devil, Mutaurus, and Ogur as Mogul assaulted Asgard. The warriors of Asgard fought them, though their numbers seemed limitless. Ultimately the Demon-Riders vanished when Alibar imprisoned Mogul within the Lamp of Alaeddin. (Avengers III#1) - The Demon-Riders were among the many magical beings summoned from Asgard to Earth as part of a plot by Morgan le Fey. They fought the She-Hulk for a short struggle before vanishing along with the others summoned. If they were in Asgard again they probably died during the Ragnarok in Thor II#85.